for getting MS Project Gantt charts into PowerPoint. It is common to present project plans, proposals and project reviews to clients and executives in PowerPoint. 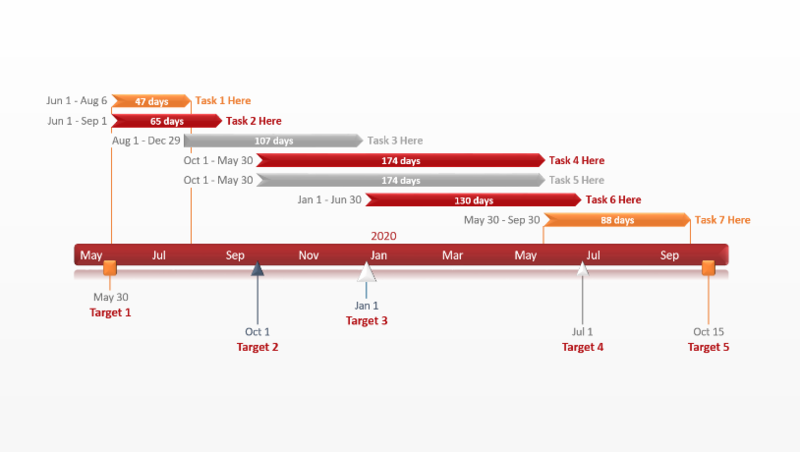 In this Microsoft Project tutorial I will show you how to prepare your Gantt chart and how to export it to PowerPoint. 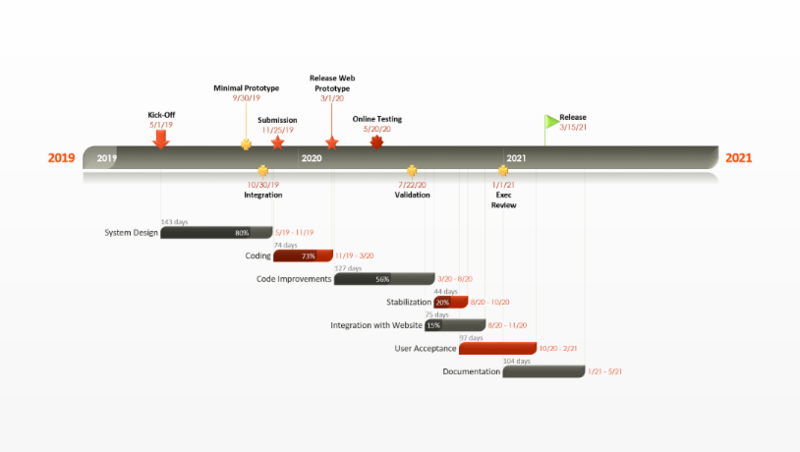 If you wish to learn how to make a timeline in MS Project, please see our step by step guide here. 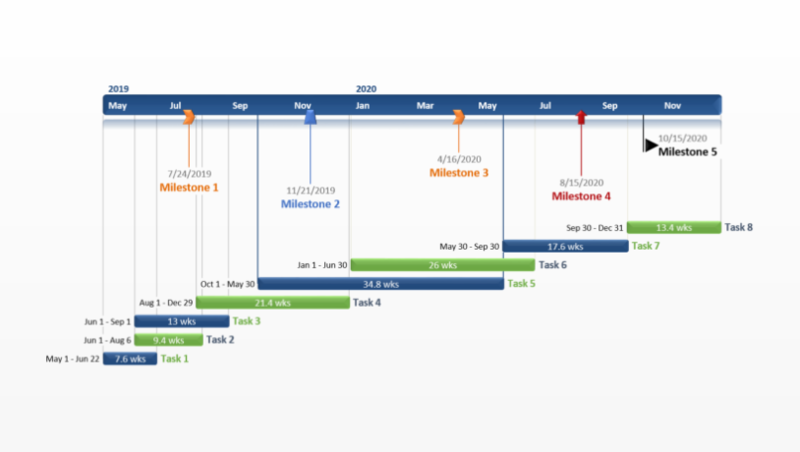 Microsoft Project 2007, 2010, 2013 and 2016 are all strong project planning tools but each produces complex Gantt charts that are difficult for audiences to follow. In this tutorial I demonstrate two options for preparing project plans as PowerPoint presentations. The first discusses some of Project’s hidden tools. It demonstrates how to use the Gantt Chart Wizard, Task Bar Format tool and the Copy Picture feature to prepare your visual. The end result will be a Microsoft Project image that can be pasted into PowerPoint. The second tutorial explains how to import Microsoft Project Gantt charts into PowerPoint with the Office Timeline Plus add-in. This method converts .mpp files into PowerPoint slides that can be shared, edited and synchronized right inside PowerPoint. Which Microsoft Project tutorial would you like to see? Presentations to clients and executive need to be simple and easy to understand. 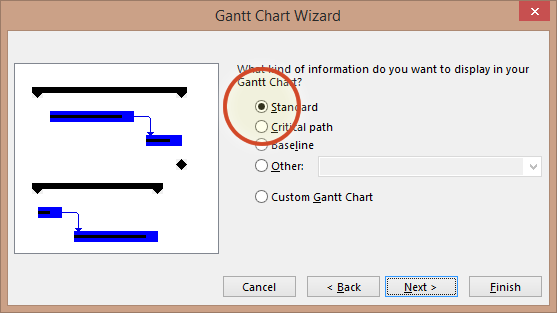 Microsoft Project’s Gantts are often complicated but using the Gantt Chart Wizard will help make them more presentable. If the Gantt Chart Wizard is hidden in Microsoft Project you will need to add it to the ribbon by following these steps. Click on File -> click on Options -> click on Customize Ribbon. In the right column beneath Main Tabs, right-click the tab where the Gantt Chart Wizard button will be added and select Add New Group. This adds a new section to that tab of your Microsoft Project ribbon. The new section will be listed as New Group (Custom). Right click on New Group (Custom) and rename it then click OK. I called mine Visual Tools. Staying in the Project Options window under Choose commands, select Commands Not in the Ribbon. 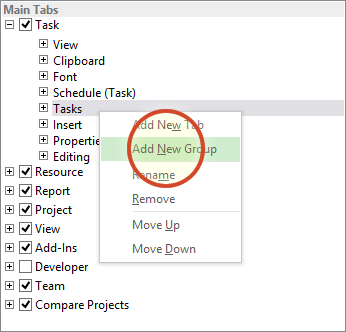 In the column on the right highlight the new group you created in step C (I named mine Visuals Tools). In the left column scroll down and select Gantt Chart Wizard and then Add to include the Gantt Chart Wizard in your new group. Click OK to exit. 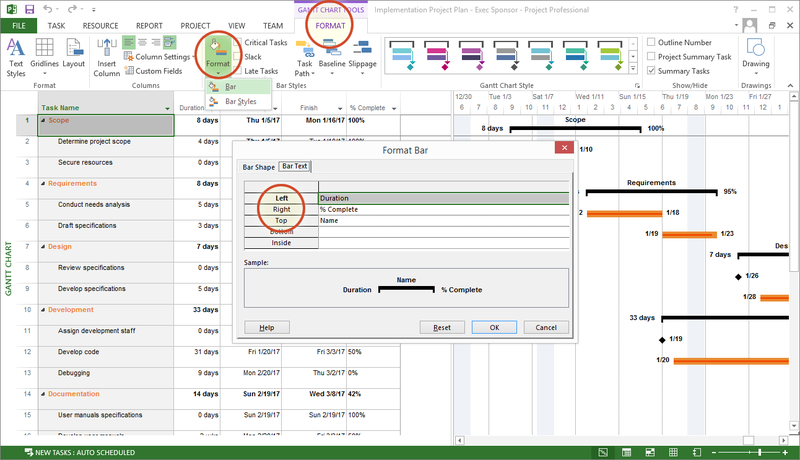 You will now see the Gantt Chart Wizard in Microsoft Project’s ribbon. In my example I placed it on the Task tab in the section I added called Visual Tools. Click on the Gantt Chart Wizard button and the first styling option you get is to select what type of Gantt information you want to display. For client and executive presentations keep project visuals simple to understand by displaying only Standard information. 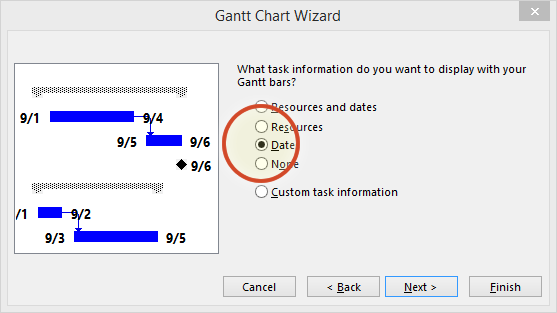 The second step of the Gantt Chart Wizard allows you to select text you want to display alongside your tasks bars. To keep my Gantt chart uncomplicated I selected Dates. 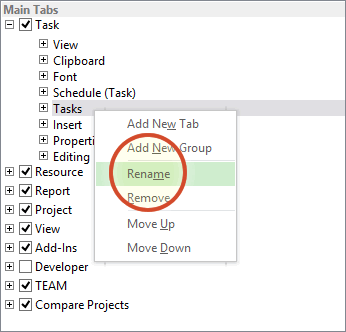 Further down in this Microsoft Project tutorial I show you how to add additional information to any task. 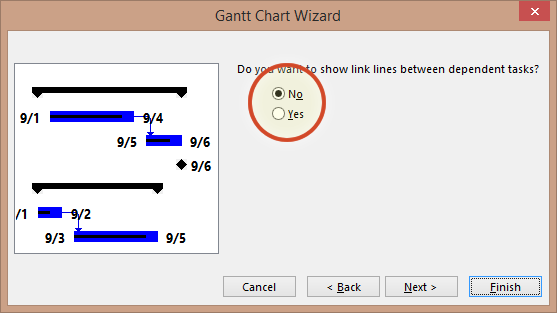 The final step of the Gantt Chart Wizard is to select whether you want to display links between dependent tasks. 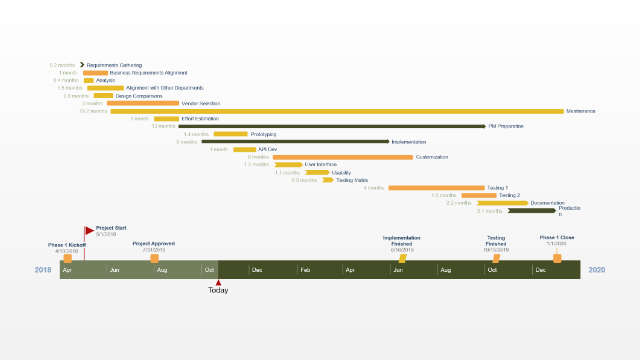 I opted not to show these links in an effort to keep my Gantt chart as easy to read as possible. 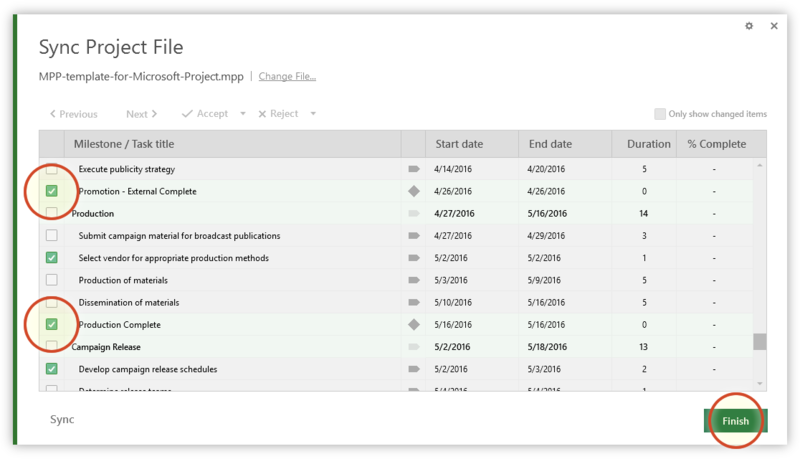 From the Format tab, drop down the Format control to change the appearance of your tasks. 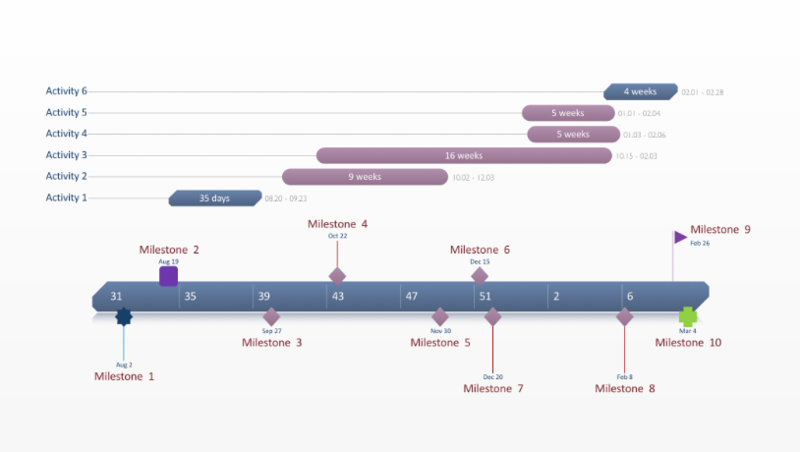 Here you can add and rearrange important elements to your Gantt chart. In my example I added titles (name), durations and % complete for each summary task. Now you need to create an image you can paste into PowerPoint. 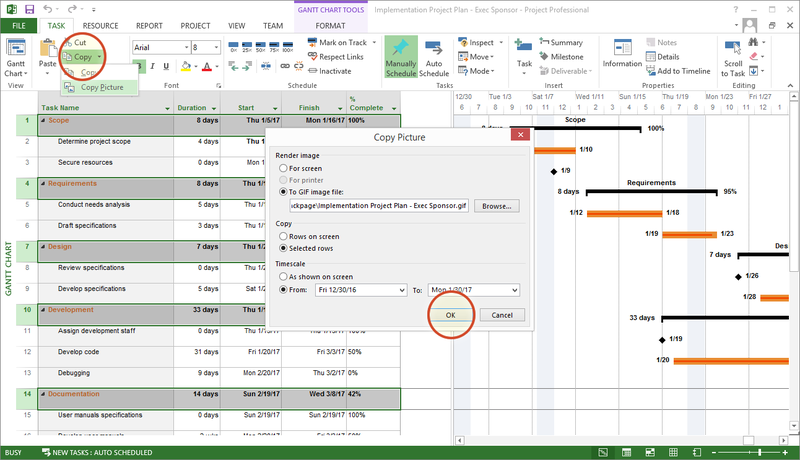 Microsoft Project has a feature called the Copy Picture tool which allows you to choose which tasks you want to show in your visual. This is useful for paring down project tasks to the ones that are critical for your presentation. 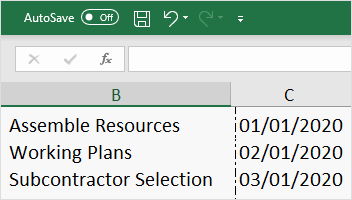 On your Task list view in Microsoft Project, select all the Task rows you want displayed in your image (hold CTRL + click to select each item). In the example below I selected all my Summary Tasks rows. On the Task tab drop down the Copy button to find the Copy Picture control. Choose to render image as a GIF file. Choose to Copy Selected Rows. Browse to your GIF and right click to open it with an editing tool like Paint, or click on it to open it in a browser. Copy your image with a snipping tool or cropping tool and paste it onto your PowerPoint slide. 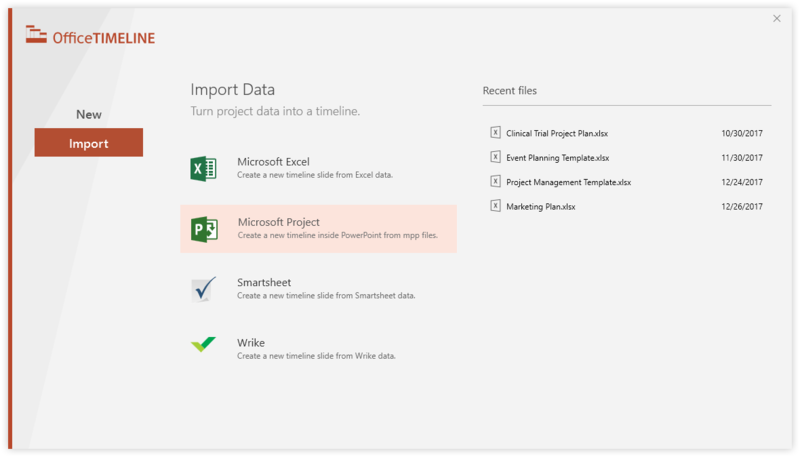 Import Microsoft Project data directly into a PowerPoint with a Gantt chart add-in from Office Timeline. PowerPoint is a visual application and better suited for creating the type of visuals client and executive expect. 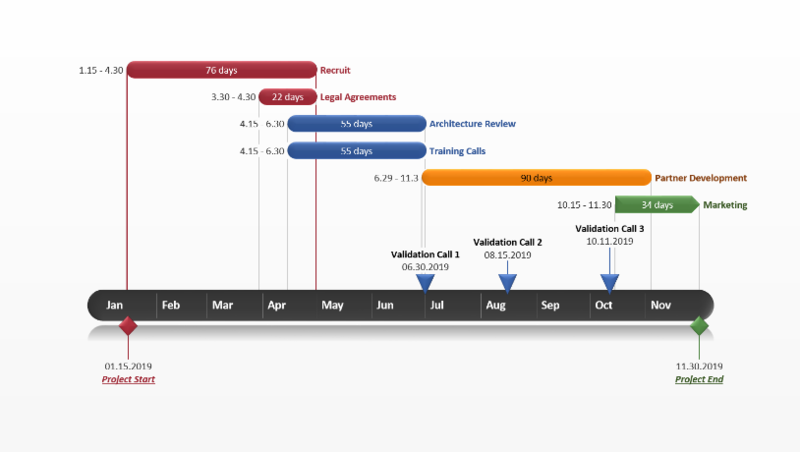 Office Timeline is a PowerPoint add-in that imports data directly from Microsoft Project and transforms it into rich visual Gantt charts instantly. Since these charts are a native PowerPoint slides, they can be opened, shared, presented, updated or edited by anyone who has PowerPoint. Open PowerPoint and click the Import button on the Office Timeline tab. Click on Microsoft Project in the Import wizard and select the mpp file you wish to load. Now, from the .mpp import list view, select what MS Project data you would like to show on your slide. You can choose to display some or all of the imported items. 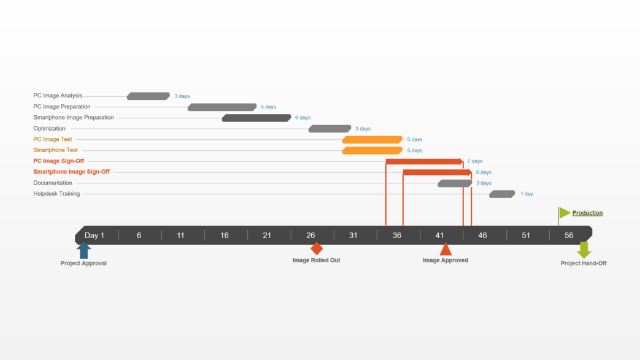 Office Timeline will instantly create a PowerPoint Gantt chart slide from your Microsoft Project data. Mine looked like this and it took less than a minute to make. 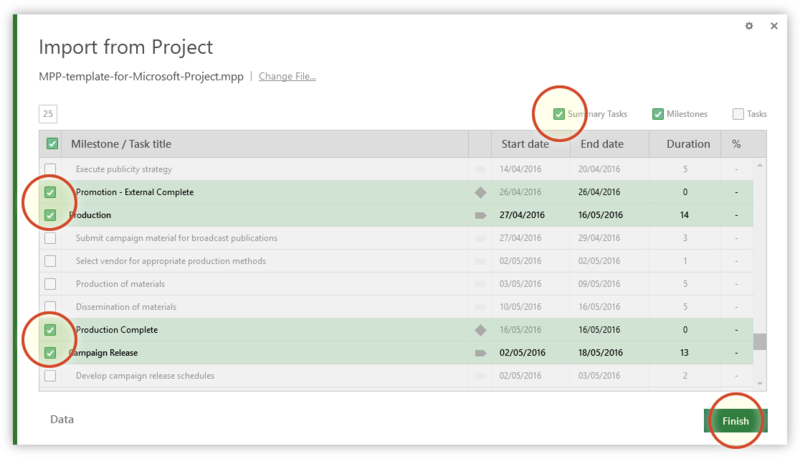 Click the Sync button on the Office Timeline ribbon to update your Gantt whenever the data changes in your Project file. The sync wizard will identify any changes to the mpp file. 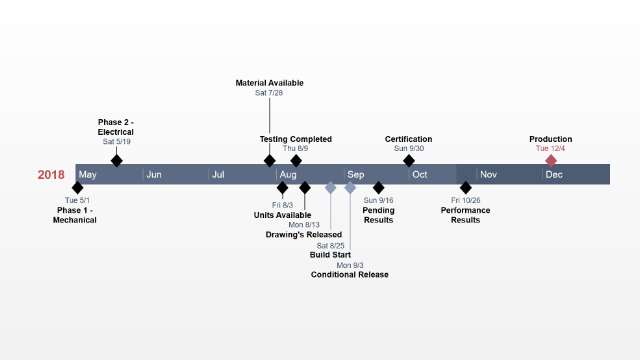 Select the changes you want to accept and click Finish to update your Gantt chart. Your slide can be updated in real-time. 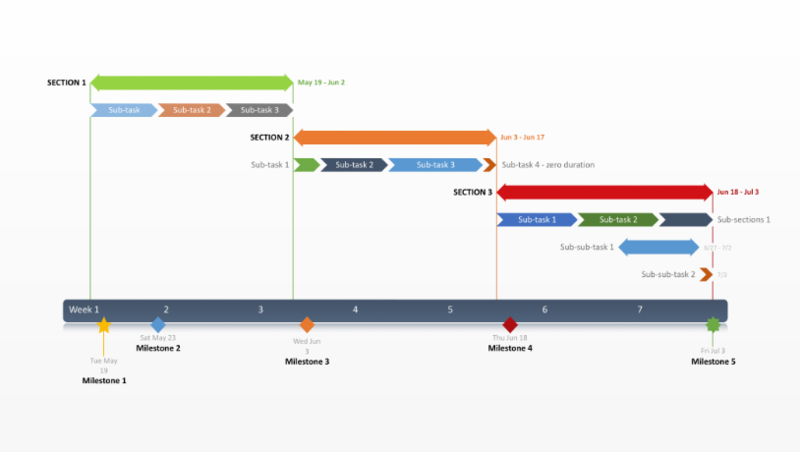 Below, I synchronized my Gantt chart with its linked MS Project file to add tasks and milestones, and then I made some styling changes - for example, changing colors, shapes, and text positions, and switching the timescale from months to weeks. All of this was instantly done using the Style Pane.